Are you feeling overwhelmed by the ever-accelerating pace of incoming information and stimuli in your life? Are you craving the opportunity to reconnect with nature? Is it time to shift your focus to self-care, and finally let yourself exhale? Finding ways to build spaciousness and quiet into our lives no longer feels like a luxury. It’s rapidly becoming the essential missing ingredient of a balanced life, which in turn can provide the grounding for everyday bliss. 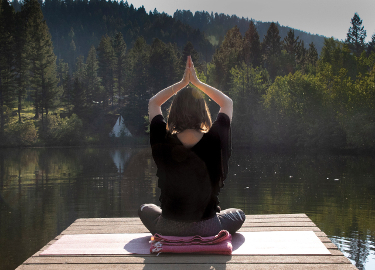 Join Restorative Yoga pioneer Judith Hanson Lasater and effervescent daughter Lizzie Lasater for a wonderful week of Restorative Yoga Summer Camp at the legendary Feathered Pipe Ranch. During this gently-paced and nurturing week you will come to understand more deeply that true rest is an essential component to a well-balanced life. 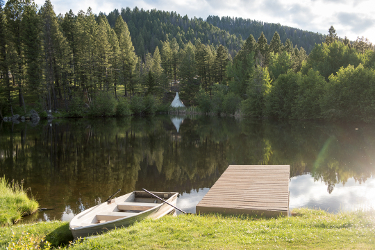 This healing week in a pristine, mountain-ringed Montana forest offers a chance to quiet down and access your inner wisdom, free from the pressures and distractions of an overly busy life. Restorative yoga relies on the generous use of props such as bolsters, blankets and blocks to create passive postures to support relaxation and health. 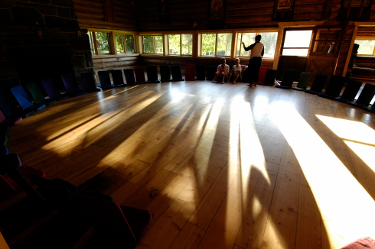 Daily rhythm consists of an active morning practice and an afternoon Restorative session. The practices are simple and accessible to all. 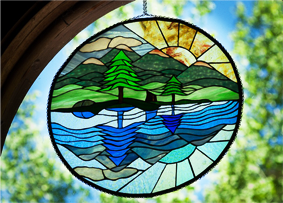 You will also enjoy three home-cooked, plant-rich nourishing meals, along with plenty of spacious down time for silence, reading, journaling, daydreaming, hiking, sauna, hot tub, or just floating peacefully on the lake. Treat yourself to a session with one of the amazing Feathered Pipe Ranch body workers who will be available for you during the retreat. Sleep in a rustic but cozy room, or gaze up at the stars from a yurt, tipi or tent. Gather round an evening bonfire for quiet contemplation or friendly conversation. The week’s schedule will also include an opening welcome circle, an evening yoga teacher’s Q&A session, a bonfire by the lake, a traditional sweat lodge, and the celebrated Ranch tradition: the no-talent talent show. This is the smallest event Judith teaches all year – and limited to just 38 students. Save your spot by making your deposit today. And here’s an inspired idea! If one week at the Ranch is heavenly, two in a row is divine: treat yourself to a Feathered Pipe double-header and join Judith the week before at her Finding Your Still Point Retreat. RETREAT TIP! Extend your time in peace and beauty while savoring Western hospitality by spending some time exploring the great West’s National Park treasures either before or after your retreat with Lizzie and Judith at the Ranch. Glacier National Park is a glorious and scenic 3.5-hour drive north and west of Feathered Pipe, while Yellowstone is just a 4.5 hour drive south and east of the Ranch through some of the prettiest Western territory you’ll ever see. Raised in San Francisco and trained as a designer, Lizzie Lasater March, RYT, teaches yoga internationally and online. 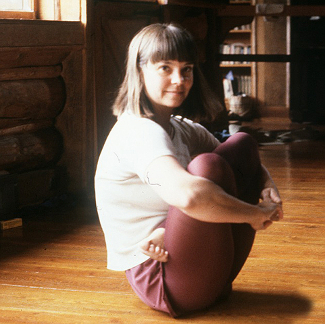 She jokes that yoga ”runs in the family” because her mom, Judith Hanson Lasater co-founded Yoga Journal magazine and has been teaching since 1971. You can find Lizzie on Instagram (@lizzie.lasater) where she posts about deceleration. She lives in the Alps with her Austrian husband. Arrival and departure: Please plan to arrive at the Ranch no later than 5pm on the arrival day (Saturday, 3 August) of your retreat so you can join us for a tour of the grounds before dinner at 6:30pm and our group evening orientation following dinner. Please arrange to leave the Ranch in the morning or early afternoon of departure day (Saturday, 10 August). There are no classes or sessions on departure day. We request that our guests depart their lodging by 9am on departure day to give our staff sufficient time to prepare for incoming guests.